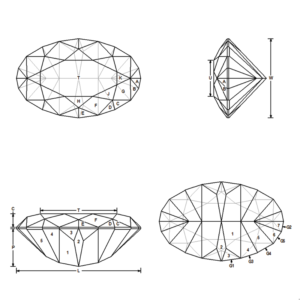 The Canoe Oval faceting design is a simple meet point oval with an L/W of 1.57 – which is pretty long. 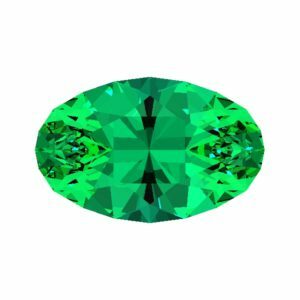 By itself, an L/W that great means it’s not a beginner stone – or even a beginner oval. In cutting this design, we’re also going to be doing some things by eye – and adjusting some facets on-the-fly. This also means it’s not a beginner stone. But, it’s also not what I’d call really advanced, either. This is a progressive intermediate level diagram that’s going to bring-along precision and develop skills to make adjustments confidently on the go. This design performs really well in most materials, but is optimized for Tourmaline. It will really benefit longer roughs suitable for a keel-style pavilion. A GemCAD file is available to Academy members. Members also get two 10-minute videos – one for pavilion and one for crown – detailing each step of the cutting process, how to deal with challenges, how to make the necessary adjustments, and some material on sequencing strategies for greater L/W designs.